Another year has passed and the time has come for another month full of merlot. Every October our Wine Pairing Weekend (#WinePW) group celebrates International Merlot Month that began back in 2012. It’s our opportunity to sample wine from a large variety of winery participants that take part in this event. This year I’ve been blessed with the chance to try a number of merlot bottles from a variety of producers including Duckhorn, Ca’ Momi and Markham Vineyards. 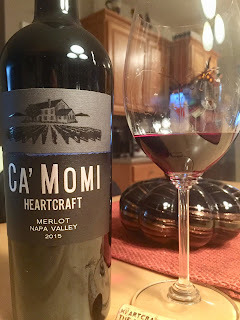 All the wines shared hail from California where merlot is the 3rd leading red grape grown. I even will be trying NorthStar Merlot from Columbia Valley, WA this month. So grab a glass of merlot and join us in the fun! The winery was started in 2006 by 3 Italians: Stefano Migotto, Dario De Conti and Valentina Guolo-Migotto. It's name represents the "House of Momi", which is an important landmark in the owner's mother country. Growing their grapes in Wild Horse Valley and the Carneros district. Made from 100% merlot. This wine was full of juicy red berries. A medium-bodied wine with nice bright acidity up front with plush tannins. Finishing with vanilla notes. This wine is aged 8 months in both French and American oak. I paired this wine with a classic roast chicken dish and I also tried it the next night with a creamy parmesan herb chicken mushroom pasta. It went well with either dish, but I actually enjoyed it with the simplicity of a roasted chicken. 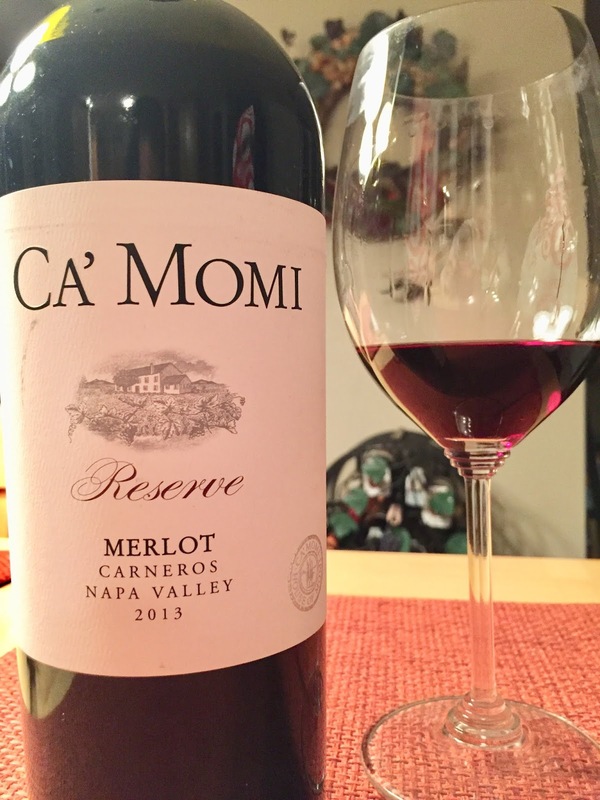 This is the 1st release of their reserve wine for Ca’ Momi. It hails from the Carneros district of Napa Valley. A full-bodied wine with much depth and complexities. Rich, ripe fruit full of raspberries, plums and blackberries. The wine needed to open up a bit since when I first opened it the tannins jumped out to say hello ; ). As it had an opportunity to open up the tannin became well integrated into the wine backed with good acidity. 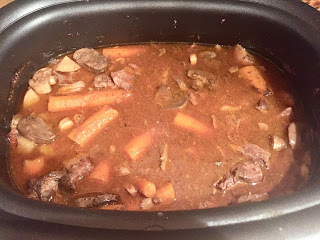 I paired this wine with a hearty beef bourguignon in the slow cooker. Slow cooker meals are a life saver some days. I did also try it with the chicken dish, but it stood up much better to the beef. It's depth and body stood up well to the spice and beef in the dish. Join in our merlot conversation this Saturday at 11am EST on Twitter at #WinePW. 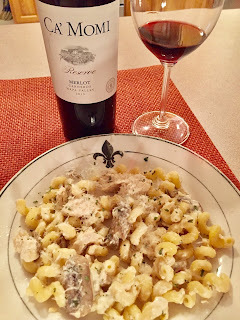 Read on for many fantastic food and wine pairings with merlot. Jill at l'Occasion shares "#MerlotMe In The Kitchen"
Cindy at Grape-Experiences writes "#MerlotMe with Family, Friends, and Food"
Lori at Dracaena shares " #MerlotMe and the Little Chef "
Gwen at Wine Predator shares "Washington #MerlotMe Paired with Ahi Tuna and Salmon for #WinePW"
Rupal at Syrah Queen shares "Celebrating #Merlotme with Duckhorn & L’Ecole 41"
Camilla from Culinary Adventures with Camilla shares "So Many Merlots, So Many Pairings for #WinePW"
Martin at Enofylz shares "Penne Boscaiola Paired with 2015 Duckhorn Napa Valley Merlot"
David at Cooking Chat shares "BBQ Beef Stew with Three Palms Merlot"
Michelle at Rockin Red Blog shares "Enough Already! Just Drink Merlot"
Sarah at Curious Cuisiniere shares "Peking Duck and a Merlot Wine Pairing"
Jane at Always Ravenous shares "Food Pairings for Merlot Lovers"
Julian at BC Wine Trends shares "BC Merlot with Ribs for Thanksgiving"
Wendy at A Day in the Life on the Farm shares "A month of #MerlotMe Wine and Food Pairings"
Nicole at Somms Table shares "2 oz Pour: #MerlotMe Moments"
Liz from What's in that Bottle shares "I've Got #MerlotMe Mania"
Jeff at Food Wine Click! shares "Merlot for Every Day of the Week"
*These wines were provided as samples, but opinions are my own.